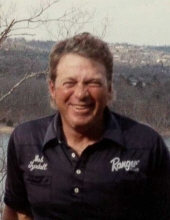 Celebrating the life of ROBERT EUGENE TYNDALL, JR.
Obituary for ROBERT EUGENE TYNDALL, JR.
Mr. Robert Eugene Tyndall, Jr., age 74, of Republic, Missouri, passed away on Wednesday, January 16, 2019 in his home surrounded by his family. He was born on January 17, 1944 in Springfield, Missouri, the son of the late Robert Eugene Sr. and Frances May (Johnson) Tyndall. Robert was an expert fisherman and guide and had held the Bass Masters Tour title for several years. He was also fond of watching old movies. He is survived by his friend and former wife, Jane Tyndall; two sons, Robert Tyndall and Randall Tyndall; a daughter, Jennifer (Steve) Sowards; three grandchildren, Ashley (Will) Tiger, Shelby Sowards, and Tommy Sowards; two great grandchildren, Marissa and Lyla; two sisters, Debra (Derry) Myers, and Teresa (Raymond) Greene; and numerous nieces and nephews. To send flowers or a remembrance gift to the family of ROBERT EUGENE TYNDALL, JR., please visit our Tribute Store. "Email Address" would like to share the life celebration of ROBERT EUGENE TYNDALL, JR.. Click on the "link" to go to share a favorite memory or leave a condolence message for the family.